There were few news stories more important Wednesday than President Donald Trump firing Attorney General Jeff Sessions and, consequently, the fate of a Mueller investigation presumed to be in its twilight stages. The executive decision — of great impact to the country for a number of reasons — was overshadowed when the White House decided to pull the credentials of press corps bad boy CNN’s Jim Acosta. 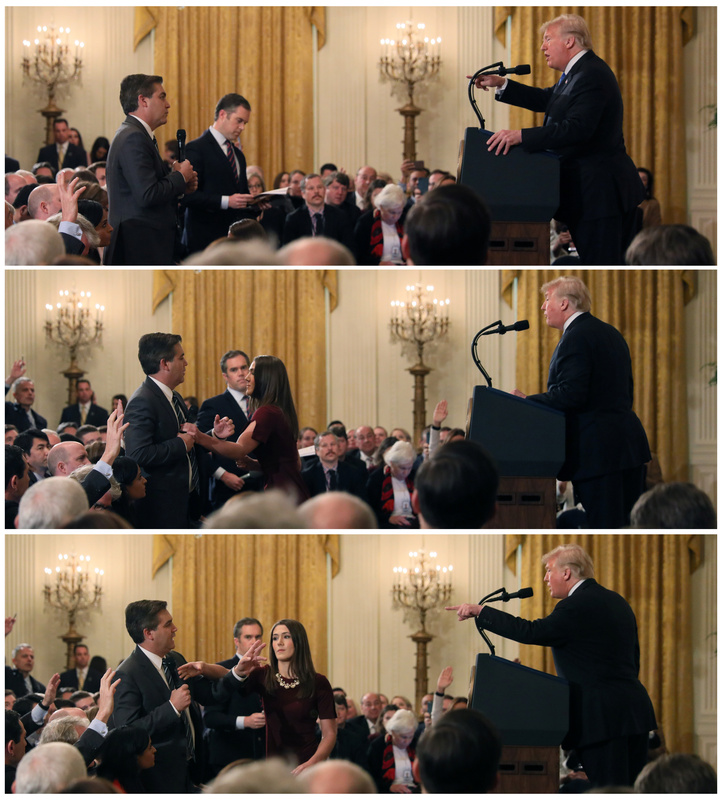 Earlier in the day, Mr. Acosta, for his part, got in a brief and minor tussle with a White House intern over a microphone during a press briefing. While the White House was justified, the decision to pull the credentials was almost certainly part of a larger strategy to distract the press. Which is exactly why the revocation should stand. Further, CNN should force Mr. Acosta to publicly apologize and then pull him from White House coverage altogether. Mr. Acosta was plainly out of order and his behavior is to the detriment of the media writ large and the country. The rest of the press, upon hearing the news, launched into a rather shameful campaign of defense, dispersion and word parsing. Sanders “lied.” Acosta did not put his “hands on” the intern. The attempt to parse terms is not only irrelevant; it omits completely the nature of press briefings, ground rules and decorum. As soon as the intern made an attempt to take the mic, it was Mr. Acosta’s role to give it up. 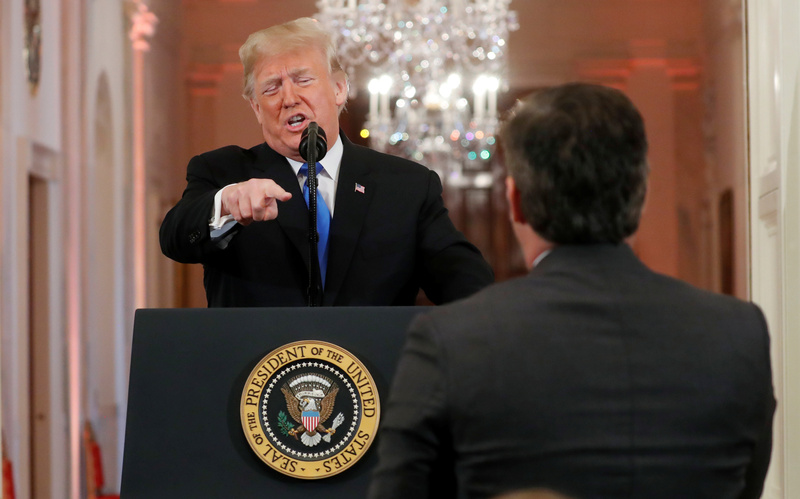 Trump has no decorum; why should Mr. Acosta? Pictured in the background of the tussle were several reporters from dozens of outlets sitting quietly with their hands raised hoping to ask a question and presumably poised to ask it without much guff. Why should the rules for Mr. Acosta be any different? She’s only an intern. The only status that matters is that she is a member of the official party hosting the presser. Never in any set of ground rules I’ve ever personally played a role in has a guest been justified to hold a microphone hostage during a yelling match with the principal. And even if the host is wrong — as going for the mic may well have been — that decision is held to account separately. 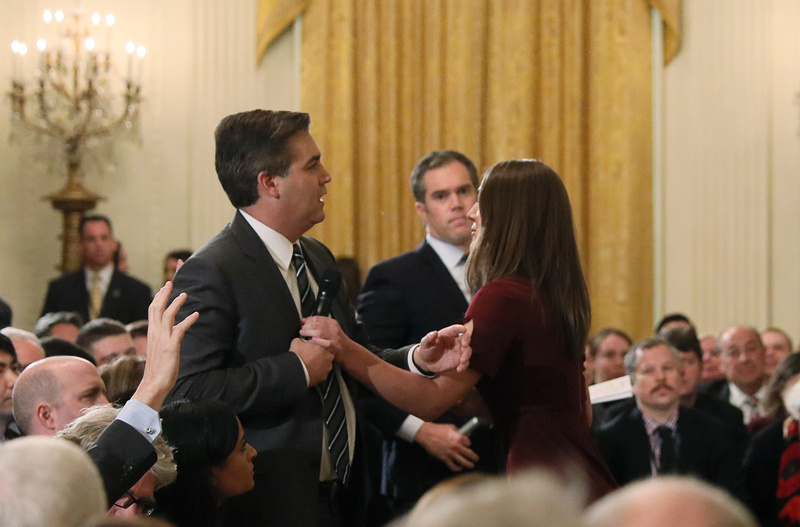 Mr. Acosta was just “asking a question,” and the White House banned him for “asking questions.” Mr. Acosta’s first words when he got the mic were, “I’m going to challenge you.” Enough said. There was no substantive question. Mr. Acosta launched into a lecture about use of the term “invasion.” He, at the last second, as he was sitting down, said he wanted to ask about the Russia investigation. He should have led with that. In any case, he was not “asking a question” when his mic was pulled. When the president gave the signal, the intern went for the microphone. Conducting himself as if he were in an above-ground pool in the summer of ’95, Mr. Acosta actually decided to play keep away. The ensuing microphone rope-a-dope was not only shocking but completely out of order. To be clear, it was indeed physical, but he did not “put his hands on” her and he did not “karate chop” her. Overstatements aside, his behavior was unacceptable. At least some reporters pointed out the effect of Mr. Acosta’s behavior. The Acosta thing is important. It totally pales in comparison to the firing of the Attorney General. Focus, people. As a “senior” White House correspondent for CNN, Mr. Acosta conducted himself more like a junior in high school. It isn’t summertime. It isn’t a pool party in Joe Biden’s backyard. To be bold is fine. Rudeness is okay. It can be an effective strategy with a news maker. Physical tussles over mics are not. Such behavior is unnecessary theater with no goal other than self aggrandizement. There are serious matters that require serious, pointed questions, and Mr. Acosta has proven time and again he is interested only in the pursuit of his own infamy. The White House made a big show of taking questions from reporters, counted them up and touted them as a sign of transparency in fact. Yet minutes after dismissing the press, Sessions was fired. Mr. Acosta’s out-of-order behavior played a central role in the theater that aided the White House strategy of distracting from the dismissal’s timing and its fallout. For that reason, CNN should force him to apologize and remove him from his role. The country and the standing of the press will improve as a result.